Because there are way more than seven wonders in the world. I’m usually a much better planner than this. I arrived in Basel with a vague idea to explore the old city center because, as I’d already discovered, old Swiss city centers are amazing. 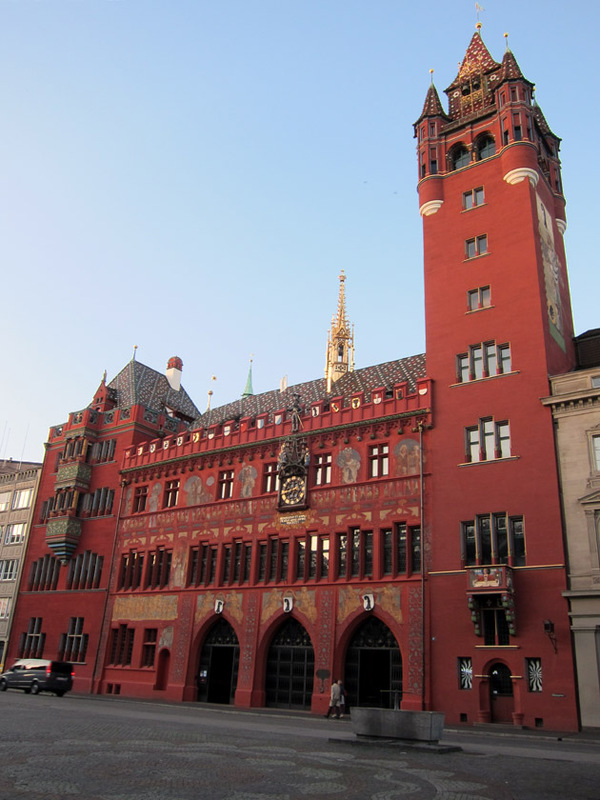 Basel’s old town is dominated by the bright red Rathaus, or town hall. Already impressed by the Rathaus’ exterior decorations, I jumped at the chance to take a guided tour of what I thought was a museum inside or minimally a preserved historic interior. 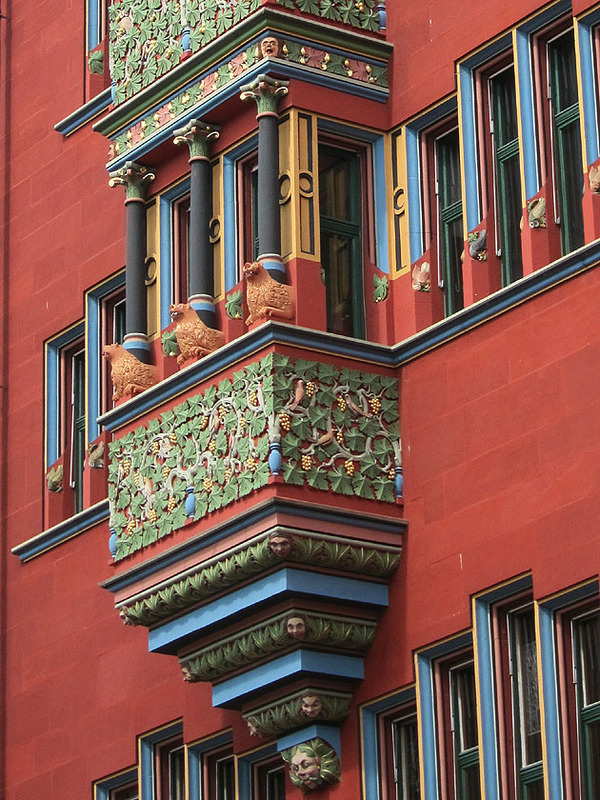 Even though the tour was in German (which I don’t speak), I completely enjoyed this insider’s look at the art, history, and, surprisingly, the contemporary life of the city housed inside this Basel landmark. 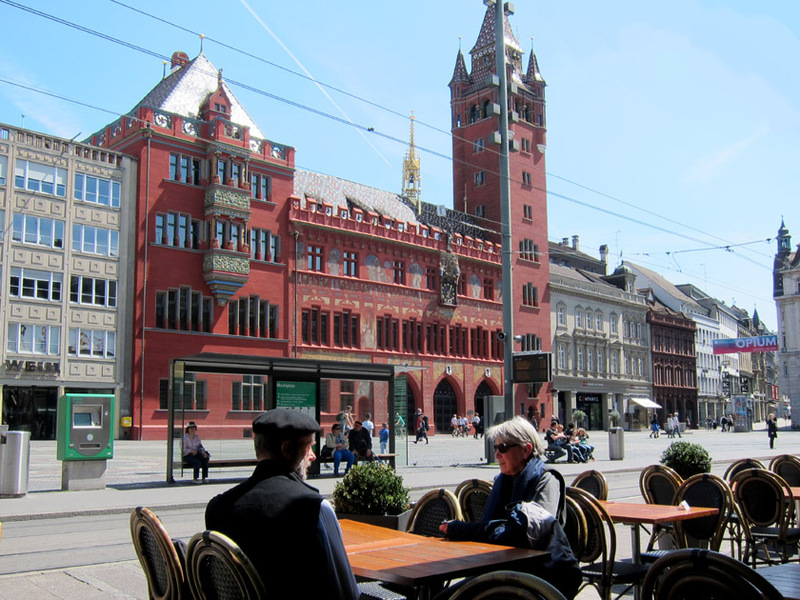 My lunch time view of the magnificent Basel Town Hall, or Rathaus, and Marktplatz square. After Basel joined the Swiss Confederation in 1501, the Canton decided to demonstrate its new political importance with a town hall. The core of the Rathaus dates to this original construction completed in 1514 and an extension done in 1608. Following extensive growth of the city in the 19th century, the town hall was extended and substantially rebuilt in 1901. The impressive tower on the right and the administrative building on the left side of the Rathaus date to this later period. 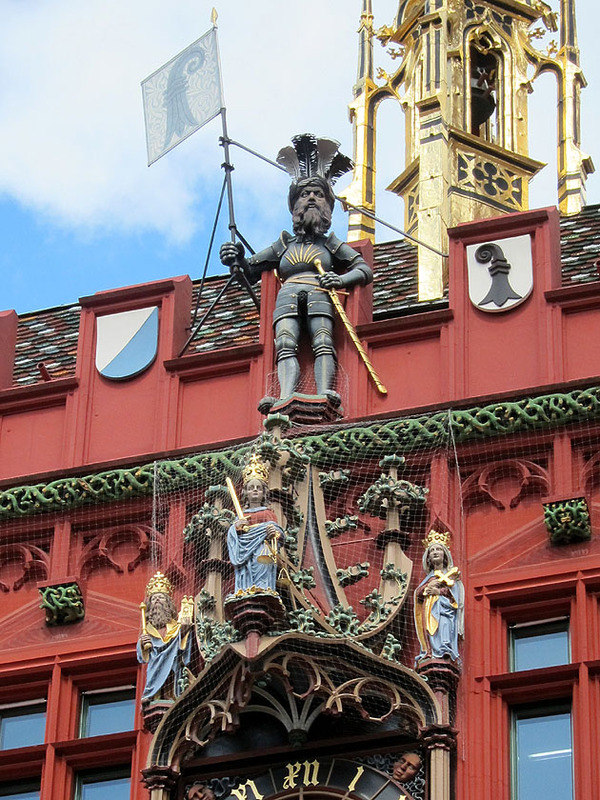 Colorful outdoor statues decorate the facade of the Rathaus. While this clock dates to 1511, the figures are replacements. I’ve always appreciated the playful recreation of Gothic and Renaissance designs in turn of the century European art and architecture. We see this all over Budapest and obviously here as well in the decoration of the Rathaus extension. Personally, I like this Neo-style of the 1900’s. It’s a distilled down and stylized homage to the past with a touch of Art Nouveau. Neo-Gothic balcony on the 1901 Rathaus administrative wing. 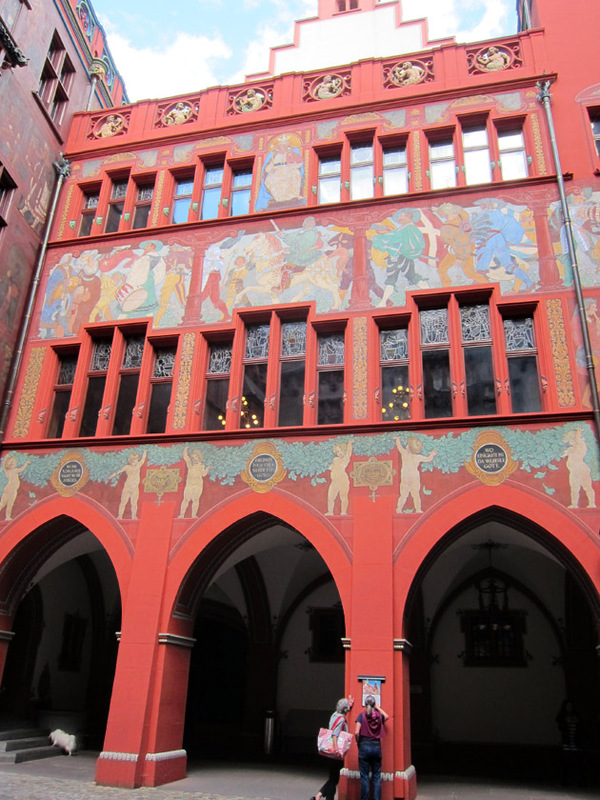 Upon entering the Rathaus, you arrive in a courtyard painted with allegorical images of law, historic judges, and scenes from the Swiss confederation. At the back of the inner courtyard is a colorful and nicely decorated portico. Back here you’ll find, what I presume to be, the original Swiss guard from the facade who has obviously seen some harsh winters, as well as the original statues of Emperor Heinrich II, Emperess Kunigunde, and the Justice personified. 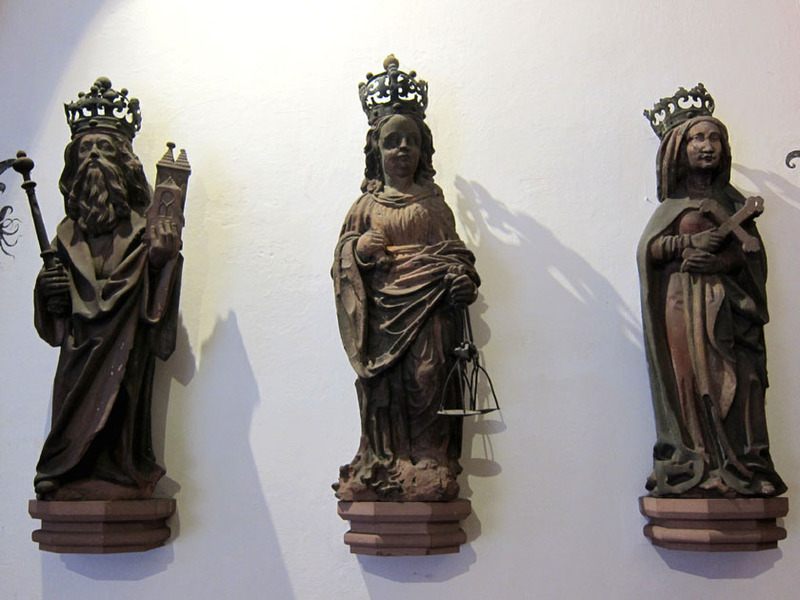 Original statues from the Rathaus facade. It was here that I joined my guide. She excitedly explained that this was her favorite tour to give in Basel, but apologized that she could only do the narration in German. I said I didn’t mind; I was just looking forward to seeing the interior. As a few more people arrive, the guide fished around a nearby office and found a couple English brochures for me which I appreciated. And with that, glossy brochures in hand, the five of us set off. When I saw that tours were only available on Saturday, I should have put it together. Why would you not give tours during the week? 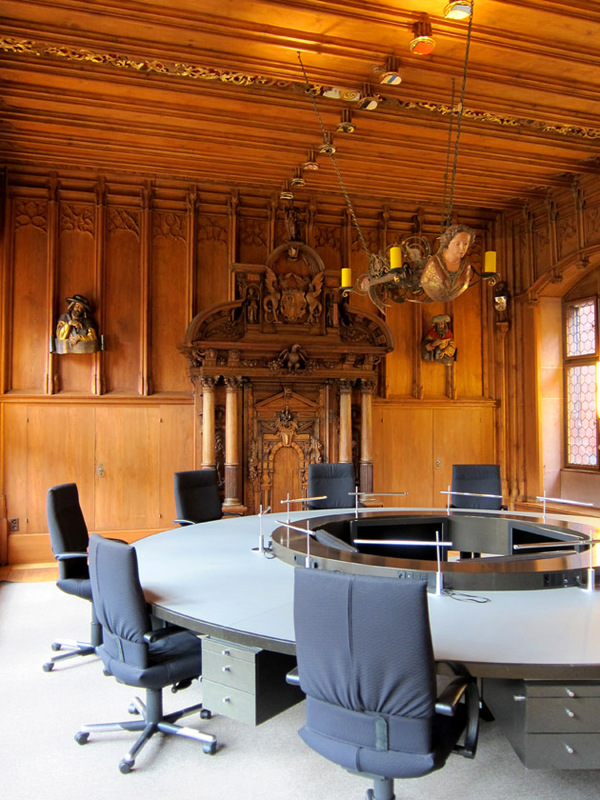 The Rathaus is a beautiful, historic building, but it is very much a functioning government building! 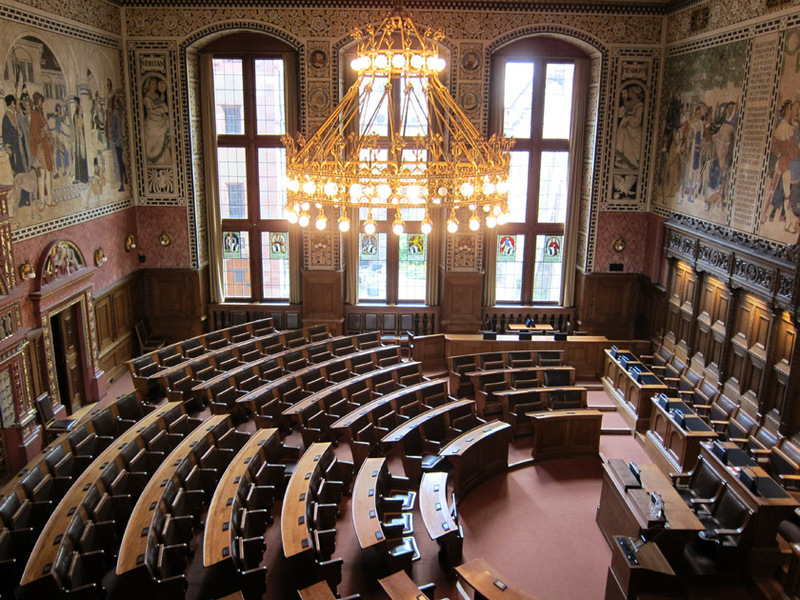 The Basel Canton Parliament still meets in the Town Hall. And what a Assembly Hall it is! 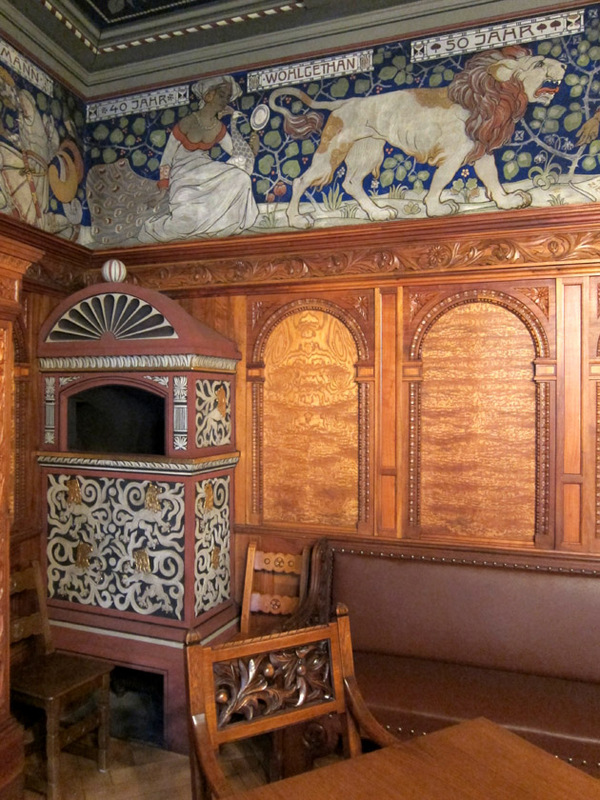 The walls were decorated with 1901 frescoes depicting the history of Basel and the unification of the cantons. I did pick out Erasmus, one of Basel’s famous residents in the mural below. Decoration over the far entrance to the assembly hall. The Latin motto translates to: “The welfare of the people shall be the supreme law”. 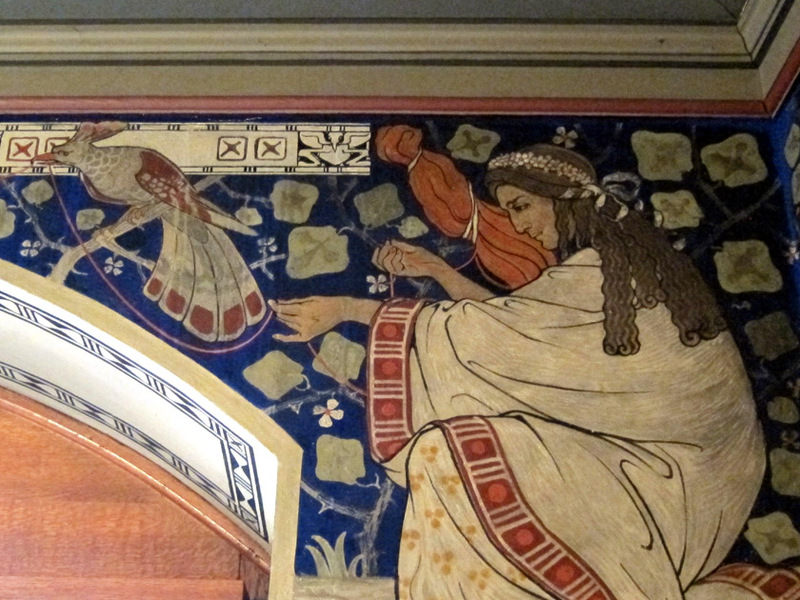 The paintings, stucco, and furniture were beautifully detailed. 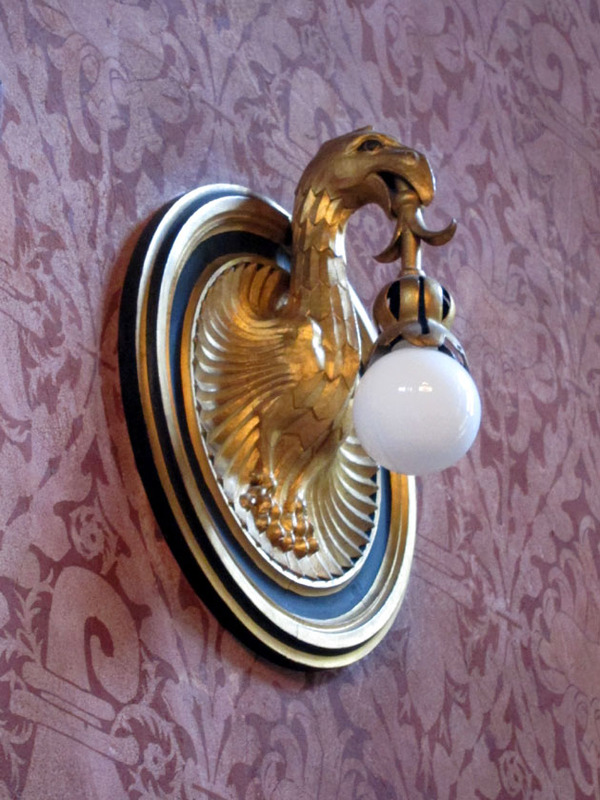 The bird lamps were one of my favorite details in the assembly hall. 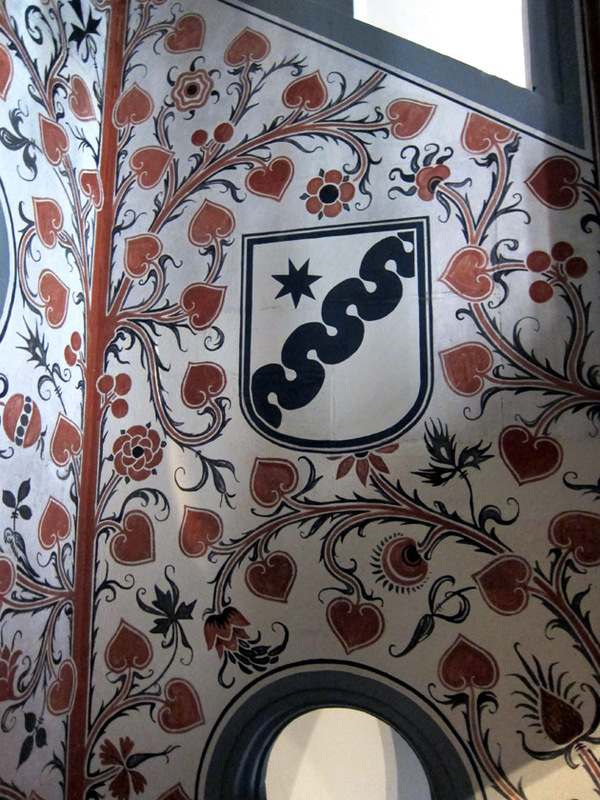 You can also see the symbol of Basel, a bishops crook, in the wallpaper design. The tour went through two small anti-chambers that the elected members use to enter the assembly hall. 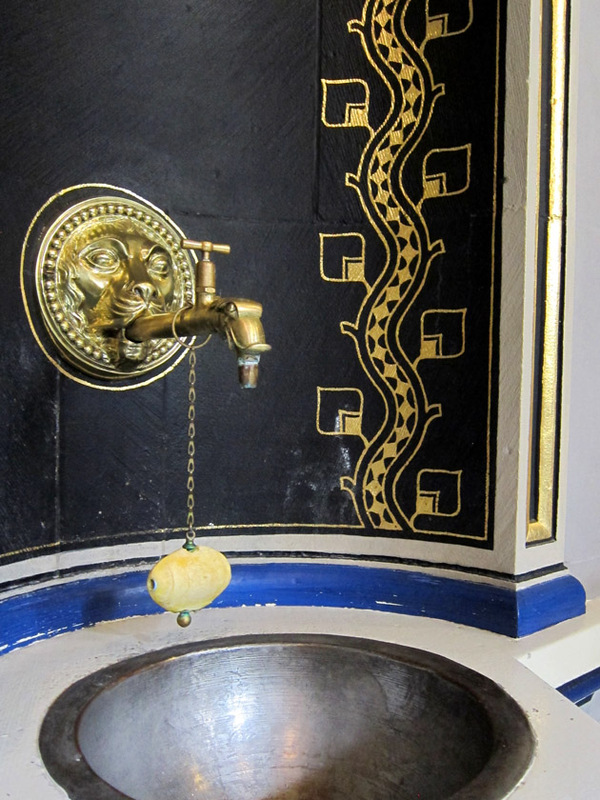 In several quaint rows were numbered coat hooks and along one wall were three sinks for hand washing. Though the decorations were lovely, I found the small rooms to be very humble and authentic. Since delegates only serve part-time (which I discovered in my brochure), I kept imagining regular people walking in off the street, cleaning up, and getting ready for legislation. 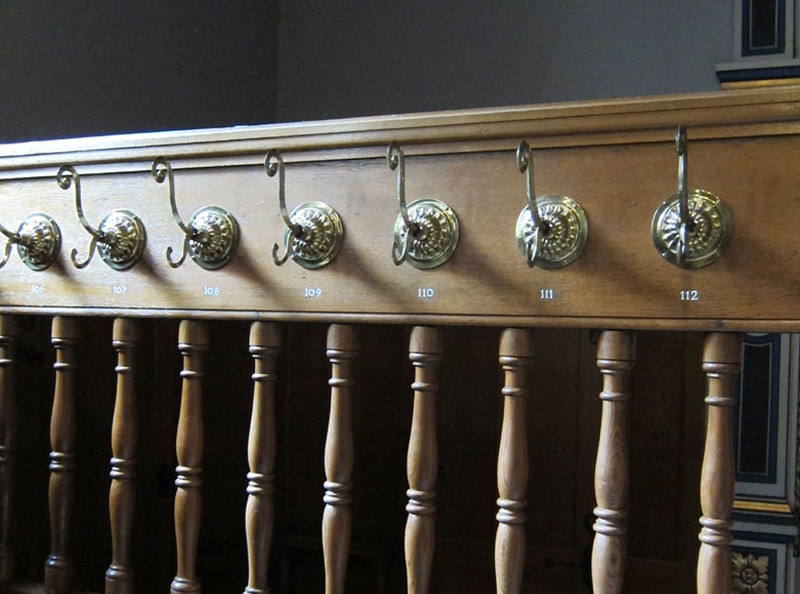 Numbered coat hooks for the Canton assembly members. Sinks in the Canton Assembly members anti-room with soap on a chain. 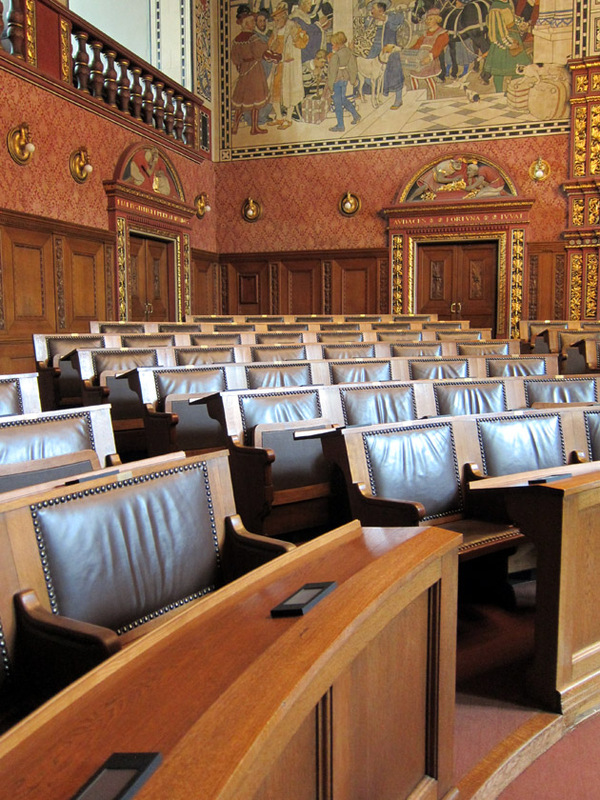 The interior of the Rathaus is a mix of styles but like the architecture itself. 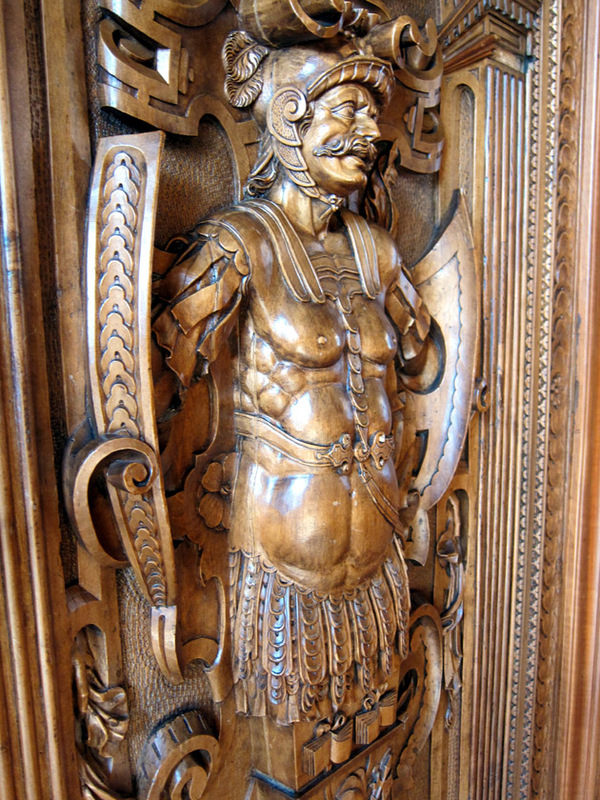 There are some historic carvings, stucco work and furniture that appears quite old. Most of the wall frescoes appeared to date from 1901. 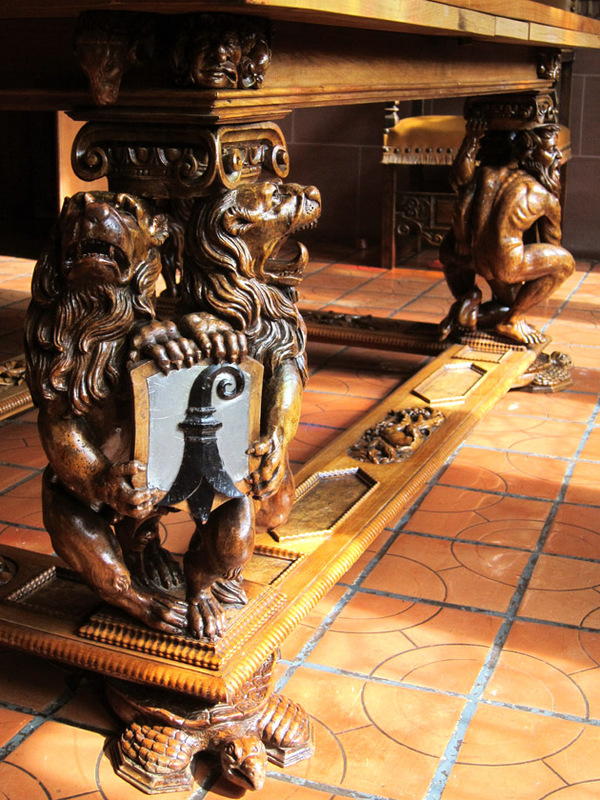 This exquisitely carved table had an inlaid top of wood and stones. 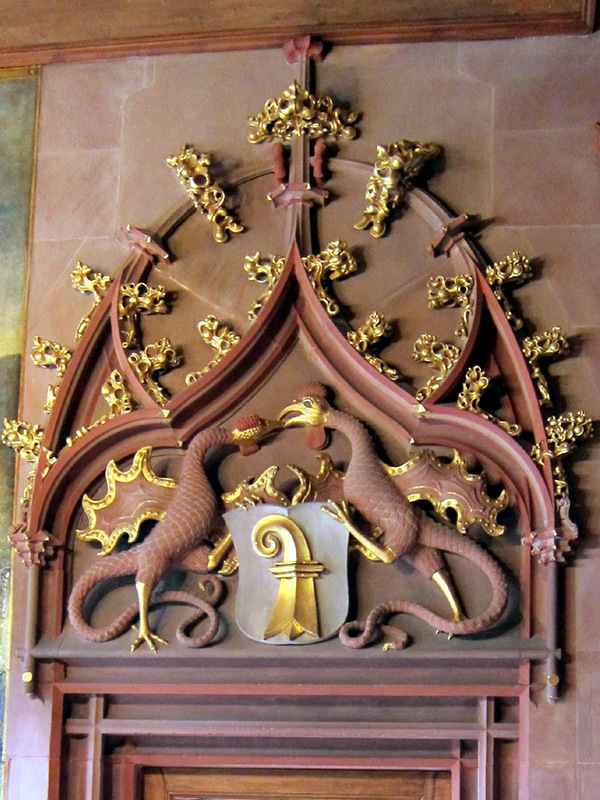 A Basilisk doorway decoration. 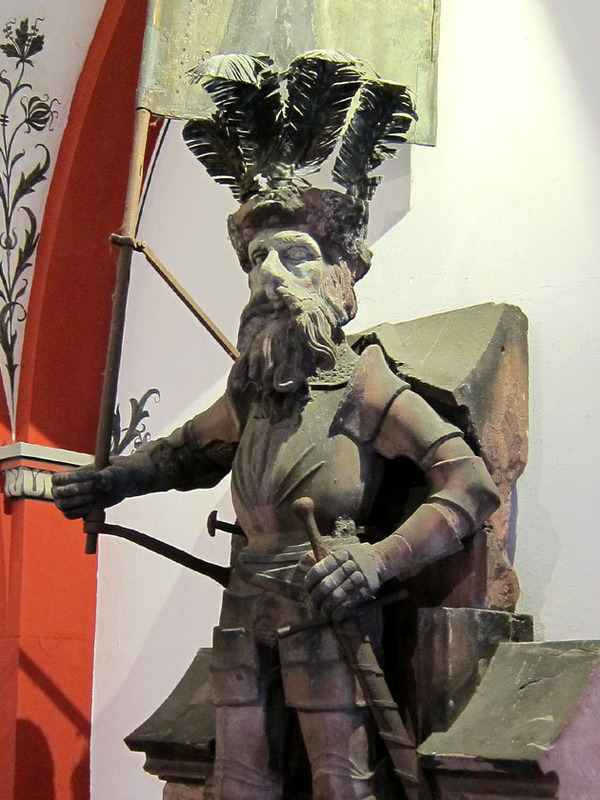 This mythical creature has long been associated with Basel, presumably because of their name. 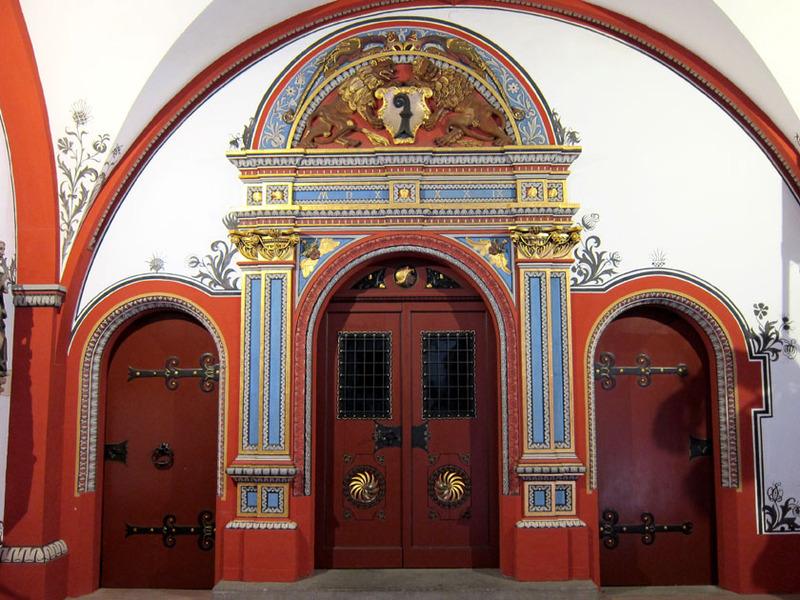 Neo-Gothic red and black stairwell decorations dating to 1901. Some of the meeting rooms were spectacular. I particularly liked the one I nicknamed the “medieval meeting room” with its hunting lodge antler chandelier and super modern desk lamps. 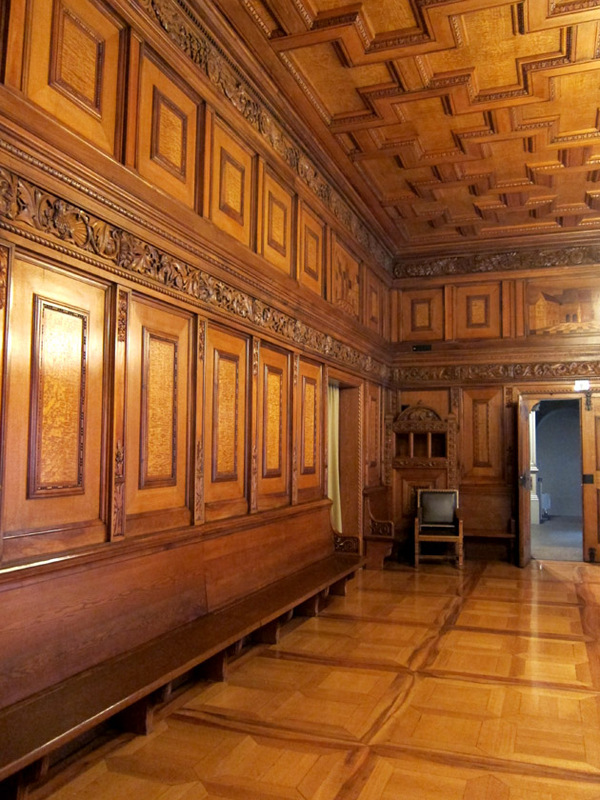 There were also several rooms decorated in artistically paneled and carved wood. Soldier carving detail from a small conference room. 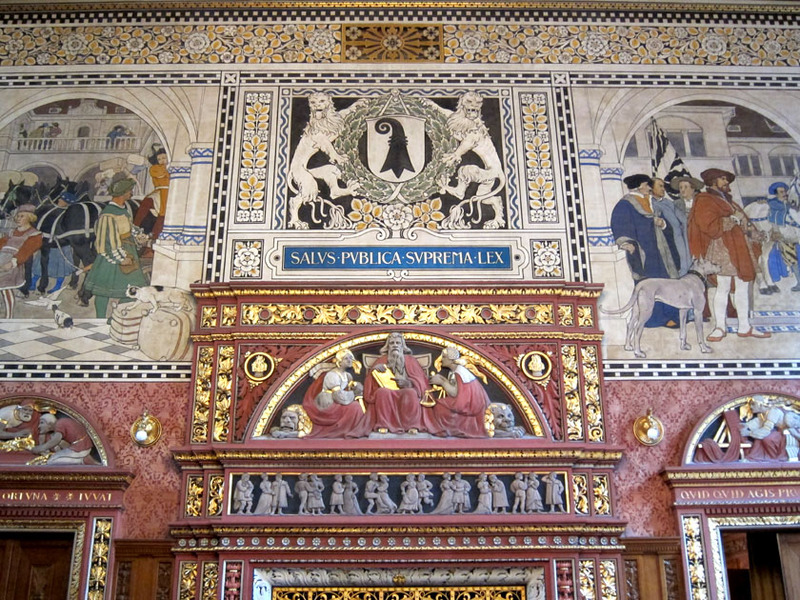 Another impressive conference room was encircled by an Art Nouveau/Neo-Gothic frieze illustrating the Thread of Life. Proceeding from the first Fate measuring out string, figures grouped by decade progressed from childhood, to adulthood, to old age, and finally to the scissors of the third Fate. It’s a sobering message for members of parliament and other government officials conducting business in this room but is delivered so beautifully that it might just lead to wistful reflection. Fate measuring out the Thread of Life. 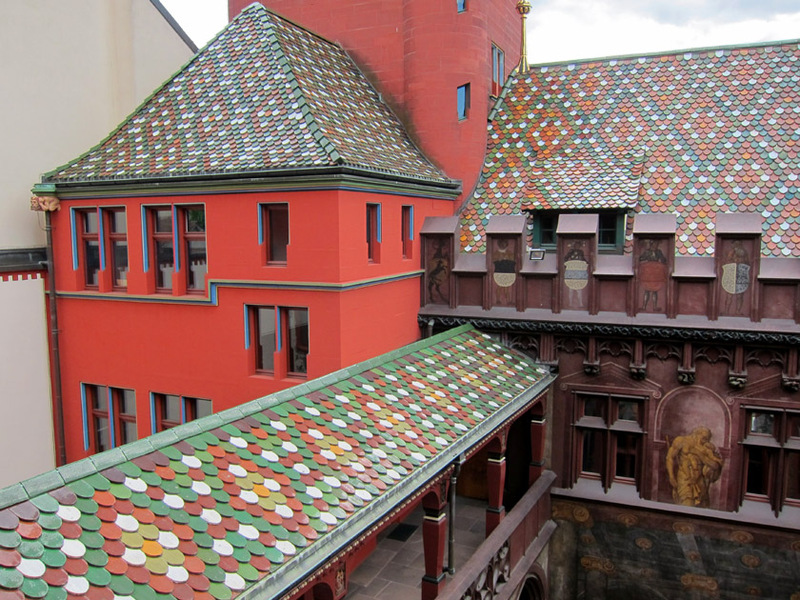 The tour eventually made its up to the roof for great views of the tiles and the inner courtyard paintings. I definitely enjoyed seeing another overlaid ceramic tile roof now that I have some perspective on how they are constructed. The Basel Town Hall was really impressive. Our tour went from amazing room to amazing room. Though largely devoid of artifacts and historic furniture, the intricate and thorough decorations had a definite presence and conveyed a sense of passed times. They were probably some of the most beautiful government offices I’ve ever been in. Your visit brought back many memories when I lived and worked in Basel. Great photos! © The Daydream Tourist, 2011-2017. Unauthorized use and/or duplication of this material without express and written permission from this blog’s author and/or owner is strictly prohibited. Excerpts and links may be used, provided that full and clear credit is given to The Daydream Tourist with appropriate and specific direction to the original content. For permission, please send a request using the contact link at the top of the page.